In the light of the current water issues, I decided to buy a small bottle of Optimum No Rinse and give it a go. You use 40 mls of ONR to 2 US Gallons of water (just under 8 litres). I followed the instructions to the letter. This meant no pre-spraying but more about that later. I used a microfibre wash mitt. The car hadn't been washed for 3 weeks. We hadn't had much rain but there was a sandpapery mix of tree sap and dust on the car. First contact with the wash mitt felt a bit dodgy - you could feel the resistance but as soon as the initial grabbyness had gone the mitt glided over the rest. I then dried each section immediately with a large Kent microfibre drying towel. On completion - and it didn't take long (20 minutes) the car felt almost as if I had polished it. I had 5 litres of water left which I used to water the garden. There was no run off apart from the odd drip and splash. When I use it again, I'm going to do a pre-spray with the ONR by just filling a spray bottle from the bucket. I think I'll feel better doing this and it will minimise any marring. I'll still do conventional washes from time to time as I like to get the hose under the wheel arches etc to remove mud and salt in the winter but I'm mightily impressed with this product after a first use. 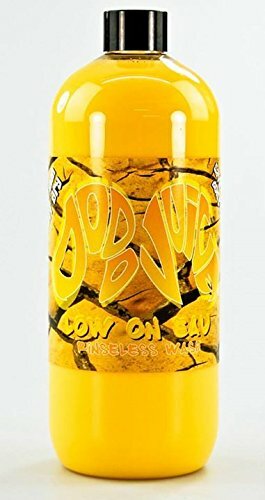 I use Rinseless Dodo Juice and I find the results excellent, no matter how dirty the car is. I do not pre-spray. I have no access to a hose, so the wheel arches suffer. In fact the only visible rust, on my 12 year old car, is at the rear wheel arch - rear bumper - joint. Yes - I've seen that around as well. Tempted to give it a go. One thing I did find is that Amazon wasn't the cheapest for the ONR - I got mine from motorgeek. Going back to the pre spray, I noticed that the first pass might have been a bit gritty but then, as if by magic, the grittiness disappeared and it was really slick. There are some really dedicated users of these products - serious detailers - and scratching does not seem to be an issue. I use the two bucket method. The second bucket is just water, and I rinse the mitt out every time before dipping it back in the shampoo solution. Uses slightly more water though, but that is not an issue here in Fife. Just on the wheel arch thing. Earlier today (ie before the World Cup) I had a quick check of the wheel arches on my Mk 3. There is no ledge type thing as far as I can see. The liner is almost level with the edge if you see what I mean - no obvious trap for crud. In short, probably little or nothing to be gained, unlike on most cars I've had in the past, in trying to blast out the crud that used to gather round and behind the lip of the wheel arch and sit there. The Mk 1 Jazz doesn't have a liner under the rear wheel arch. Only at the front. Today I was parked beside a 06 plate identical Jazz. Same model and colour. I said to the guy "I like your choice of car". His reply, "Mine's a bit rustier than yours". The rear wheel arches on his car were well rusted. I could see mine a year from now if I don't do something about it. Whenever I wash it I always get my fingers in and scrape out the crud, but it really needs the rear bumper removed and some wire brushing and Kurusting done. It's been a week since I used the ONR on my car. We've had mostly dry weather but a couple of heavy downpours, one of which I was driving through. Quite impressed by the way the car is beading. Yes it was reasonably well protected before but it seems even better now. Obviously some of the polymers stay on the paint. The Mk 1 Jazz doesn't have a liner under the rear wheel arch. Interesting, mine does - or does it not cover the entire area under wheel arch, is that what you mean (haven't checked myself)? Well I've done my second ONR wash. This time I used a pre spray (just a normal spray bottle you can get in any garden centre or Amazon). What a difference in feel! There wasn't that gritty sensation on the first application. I'd recommend the pre spray concept. You just fill your spray bottle from the bucket of dilute ONR. Started with 8 litres of water and finished with about 5 as per the last time. This was used to water some of the thirstier plants in the garden. It didn't kill them the last time so it's clearly safe. Checked the rear wheel arches and there are plastic covers, but they only cover the front section of the rear wheel arch, not the entire arch, as the front ones do.